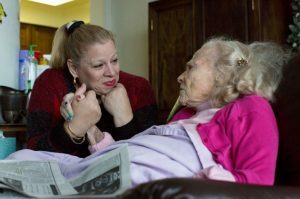 “The Shape of Care” is a dynamic new podcast that explores the world of caregiving through storytelling and information-sharing. Hear interviews with caregivers who provide care 24/7 and those who provide care from afar; care providers like geriatricians and social workers who support families and create connections among elders to reduce isolation; researchers who study aging and end-of-life issues; elders who talk about what keeps them engaged and how they deal with set-backs – and lots more. Stay tuned! The podcast will be launched in summer or fall, 2019! Q: Now you’re creating a podcast called “Who Cares?” How will the podcast relate to the book? Fried: Good question! As I spoke with people about their caregiving experiences, I discovered the universality of many of the issues I was dealing with – the challenges of being a “parent” to one’s parent, coordinating care with siblings, and making decisions about whether and/or when to put a loved one into an institution when you’re not able to provide adequate care. “Caring for Red” is my personal story, but there are many stories out there. The podcast will provide a platform for people to share their stories. Also, after all that travel, I’m pretty excited about turning to the power of audio – and broadening the conversation to anyone with access to the internet!